To make life easier during the Back to School period, we have joined the OfficeMax MySchool stationery ordering programme. This is an online and retail offer direct to parents and students where they can buy all their stationery requirements. This offer allows orders to be placed directly online over the internet and by mail order. It also allows the parent/student to go into the OfficeMax Store at 32 Normanby Road in Mt Eden. If a WINZ quote is required, you may obtain the quote through www.myschool.co.nz/mags by going through the process of placing an order. Before you go to confirm the order, you can print a copy. Another option is to go into the OfficeMax Mt Eden retail store and the staff will be able to help you with the quote for WINZ. We would encourage our parents and students to purchase through this offer, as the school also benefits and your purchases allow us to reinvest the gains made back into the school. Alternatively, you can print the list and purchase your requirements from your own choice of stationery supplier. If you wish to generate a stationery list, simply click on the subjects your child is taking and the list will be created. It is simple as that and easy to use! Visit the OfficeMax Store at 32 Normanby Rd, Mt Eden, to buy your stationery. They have all the information you need. Print the list from www.myschool.co.nz/mags and purchase in the store of your choice. These are are listed on this page in the BYOD section of the website. 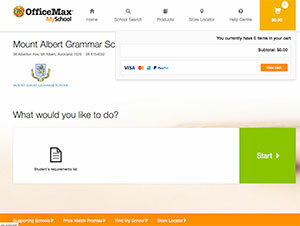 When you get to the Office Max website, tick the following compulsory subjects for your Year 9 student: English, Maths, Science, Social Studies, Art, Music and Technology. Whichever language your child selected, as stationery requirements are the same. Only tick other subjects if your child has selected them. Arrival at the beginning of the school year with all the required stationery items will allow your Year 9 child to settle quickly into their work. At the very least they should arrive at school with pens, pencils and paper for the first few days.